These child care nutrition resources were created to support child care providers in planning and preparing healthy food for children in their care. They reflect current best practices for creating supportive nutrition environments in the child care setting and will help providers meet the food and drink requirements set out in the Child Care and Early Years Act, 2014 (section 42 of Ont. Reg. 137/15). Resources found here may be printed and used for non-commercial purposes as long as they are not altered in any way. If you wish to adapt a resource found in this section, please complete this form Permission to Reproduce Form. ODPH does not have print copies available. Please contact your local health unit, as some may have print copies available to child care providers in their regions. Until more information is available, it is recommended that child care settings continue to use the Practical Guide for menu planning. For more information, please contact us by e-mail at: info@odph.ca. 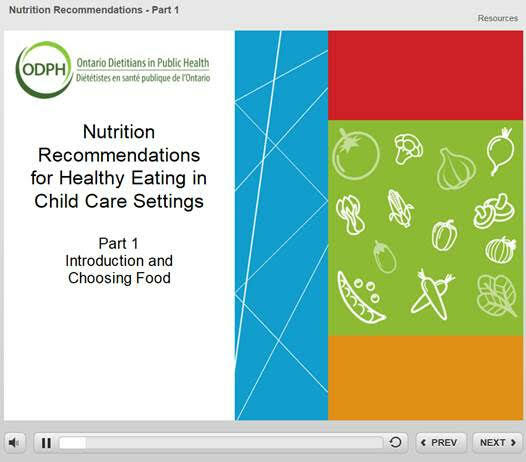 The Practical Guide includes information for child care providers on menu planning, food and beverages that should be served, appropriate portion sizes for different age groups, sample menus and templates as well as strategies to create a supportive nutrition environment. This Menu and Nutrition Environment Self-Assessment Tool will help child care cooks, chefs and providers assess their menus to meet the food and drink requirements in the Child Care and Early Years Act, 2014 (section 42 of Ontario Regulation 137/15). Learn colourful ways to make it easier for young children in your care to enjoy vegetables and fruit every day. Check out the sample policies, seasonal menus, and fun activities, as well as factsheets, posters, and tips for sharing the Paint Your Plate message with families.